Work together with Guild Members! Complete missions together to get special rewards. Complete all 4 guild missions to get special rewards! ※ This event doesn't have any individual missions, and the data will be collected based on the activities recorded from your guild. ※ Rewards are limited to MAX 30 Guild members per Guild. ※ Rewards are available only once per Guild member. ※ You can start collecting rewards from the day after you've joined a Guild. * In case of Time Limit stages, the no. of battles won in the labyrinth will be counted when the battle ends. * For Guild Mission 1, the mission will count regardless of difficulty levels. * For Guild Mission 3, the guild battle gameplay will count regardless of the results (win/loss/draw). 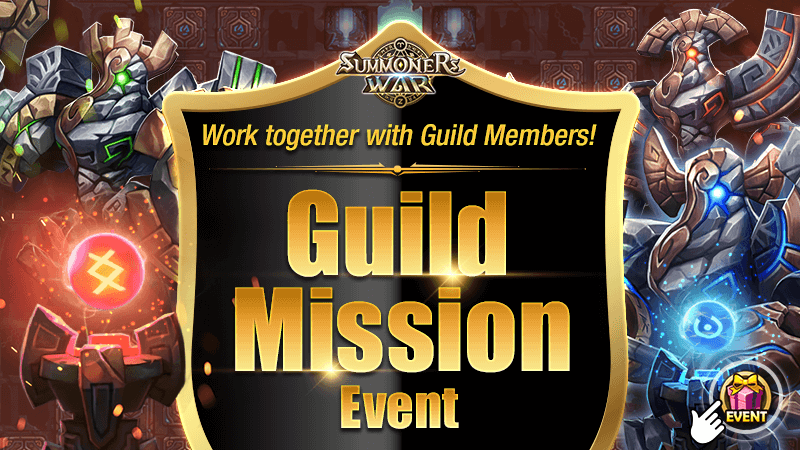 * Each mission reward is available once per Guild Member. * Previous data will be kept even if you leave the Guild during the mission. * Rewards are limited to MAX 30 Guild members per Guild. * You can start collecting rewards from the day after you've joined a Guild. Nice event. Free rewards only for contribution, and really easy to get in mid-large guilds.